Just a few days into 2019, Tesla has opened the Model 3 configurator to customers in China and select European territories, allowing reservation holders to design and order the electric sedan. With this, Tesla has begun laying the foundations of the Model 3’s international ramp, which is expected to hit its stride in the coming months. Within the configuration pages of the Model 3 in China, though, lay a rather surprising detail. When designing the Model 3 Performance in Tesla’s Chinese website, a new type of wheel for the vehicle was listed as an option. Instead of the 20″ Sport Wheels that are offered with the Model 3 Performance in the United States, China-bound vehicles are offered with 19″ “Power Sports” wheels. Tesla notes in the items’ description that the Power Sports wheels are designed for “balanced performance and cruising range.” Just like the 18″ Aero Wheel covers in North American vehicles, the 19″ Power Sports wheels include a detachable hubcap that can “better adapt to different road conditions.” Based on Tesla’s Model 3 configurator in China, the 19″ Power Sports wheels are exclusive to the Model 3 Performance; thus, customers who order the Long Range AWD Model 3 are only able to choose between the familiar 18″ Aero Wheels and the 19″ Sports Wheels found in North American units. 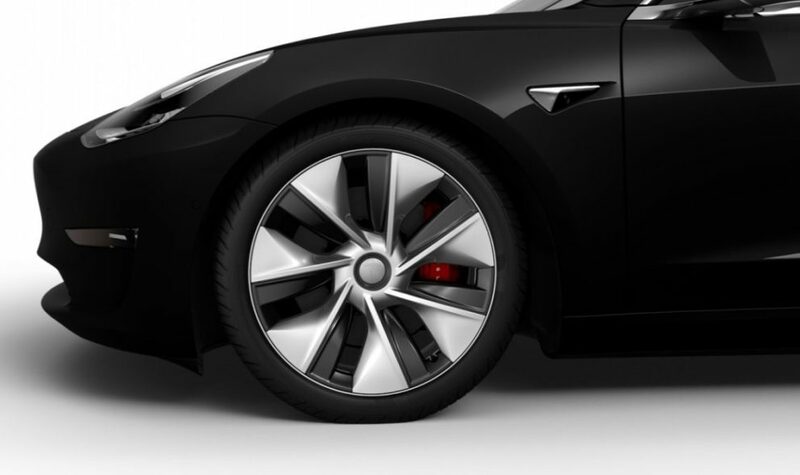 Tesla appears to have done a great job in designing the 19″ Power Sports wheels. Unlike the 18″ Aero Wheels, whose design is still polarizing, the 19″ Power Sports wheels could only be described as a very good balance between form and function. While it is unfortunate that the Power Sport wheels are currently unavailable for Model 3 in regions outside China, one can only hope that the wheels might eventually be released to other regions in the near future. Considering that the new wheels have aero components, it would be quite interesting to see how Tesla’s new Power Sports wheels affect the Model 3 Performance’s range. That said, if their range optimization capabilities are anywhere close to the company’s 18″ Aero Wheels, then the 19″ Power Sports wheels could very well be the best wheel option for the Model 3 that the electric car maker has introduced to date. The Tesla Model 3 Performance is poised to become a strong contender in China’s high-performance sedan market. Being capable of accelerating from 0-60 mph in 3.5 seconds, the vehicle is incredibly quick, and thanks to the Track Mode update, the car is capable of being driven on a closed circuit. Perhaps even more notable, though, is the vehicle’s price. Last month, the Chinese State Council Customs Tariff Commission announced that it was suspending the extra 25% tariffs it placed on cars and parts being imported from the United States. This resulted in Tesla adjusting the Model 3 Performance’s price from a rather steep 689,000 RMB (roughly $100,000) to a more reasonable 560,000 RMB (around $81,000). At these prices, the Model 3 Performance actually undercuts some of its most notable fossil fuel powered rivals such as the BMW M3 and the Mercedes-AMG C 63 Coupe, which cost as much as 998,000 RMB ($162,000) and 1,198,000 RMB ($173,623), respectively. With its current price, Tesla has practically made the Model 3 Performance one of the most bang-for-your-buck high-performance sedans in China.